Red onions, thinly sliced 1 ea. Flour tortillas, 6-inch 8 ea. Ground black pepper 1/4 tsp. Microwave the onions with the 1 Tbsp. olive oil on P10 for 2-1/2 minutes, until soft and translucent. Season with salt and pepper. For each quesadilla, sprinkle 3 Tbsp. of Jack cheese on a flour tortilla. Crumble 1 Tbsp. of the goat cheese over the Jack cheese. Spoon 2 Tbsp. of the cooked onions on top and lay 8 sprigs of cilantro over the onions. Cover with second flour tortilla and press down. 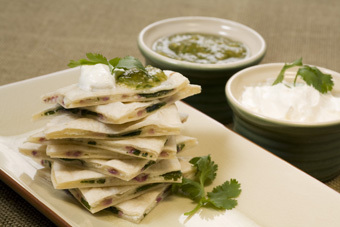 Brush quesadilla with some of the remaining olive oil, cover lightly with paper towel, and microwave for 1 minute on P8. Repeat steps with the remaining quesadillas. Top each quesadilla with 1 Tbsp. of sour cream and 1 Tbsp. of tomatillo salsa. Remove the husk from the tomatillos. Place the tomatillos and jalapeno in a 1 qt. microwave dish with about 1/2 cup of water. Microwave covered at P10 for 5 minutes, until the tomatillos are fully cooked and have become a dull green color. Remove the stem and seeds from the jalapeno. Strain the tomatillos and place into a food processor with the flesh of the jalapeno, garlic, salt, and pepper. Process until smooth. Add the cilantro and pulse until incorporated.